Britain has internationally important breeding sites for some seabirds, particularly Manx Shearwaters and Storm Petrels. Well, I say Britain, but actually it’s much more specific than that. These birds are quite particular in their choice of breeding sites, and our crowded mainland doesn’t really tick the right boxes. It’s the small islands with few humans (if any) that stand out at the seabird estate agents. Like the Isles of Scilly. But numbers of breeding seabirds have been declining even on these idyllic islands, falling by 25% between 1983 and 2006. Something needed to be done. The Isles of Scilly Seabird Recovery Programme was set up to reverse this trend. It’s a partnership between various groups, including the Isles of Scilly Wildlife Trust and the RSPB. One of the factors in the decline was the presence of rats on the island. Rats prey on the eggs and young of breeding seabirds, and can have a huge affect on breeding success. Lundy, a small island in the Bristol Channel, saw a big increase in seabirds breeding resulting from their rat elimination programme. 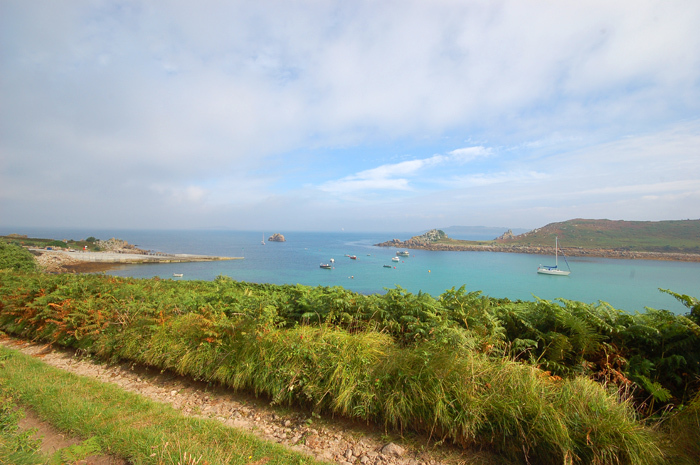 So one of the aims of the Isles of Scilly programme is to eliminate rats from the uninhabited islands, and St Agnes and Gugh. After lots of consultation and preparation, intensive rat culling started in 2013, on St Agnes. Bait stations with poison were placed all over the island. Now they think all the rats have gone, they’re in a period of monitoring, using chocolate flavoured blocks of wax to check for rat teeth marks. There’s been lots of communication with island residents and visitors, and people are encouraged to report any possible rat sightings (to rat on a rat). The island has to be free from signs of rats for two years before it can officially be declared that rats have been eliminated. If all goes well, that landmark will be reached next year. They’ve already seen benefits from the reduction in rats. In 2014 Manx Shearwaters have been breeding successfully on St Agnes, and this year storm petrel chicks were seen on St Agnes, both for the first time in living memory. Other ground nesting birds are also likely to benefit, and Scilly shrew numbers have also increased. This project is a good example of conservation groups working together with a whole community to have a big impact. It wouldn’t be possible to eliminate rats without the support of the community. Lots of work has gone into communicating about the programme, and about the importance of seabirds, to both tourists and locals. That work is now paying off. Well done to all involved. The lesser white-toothed shrew has one of the smallest distributions in Britain of any British mammal. 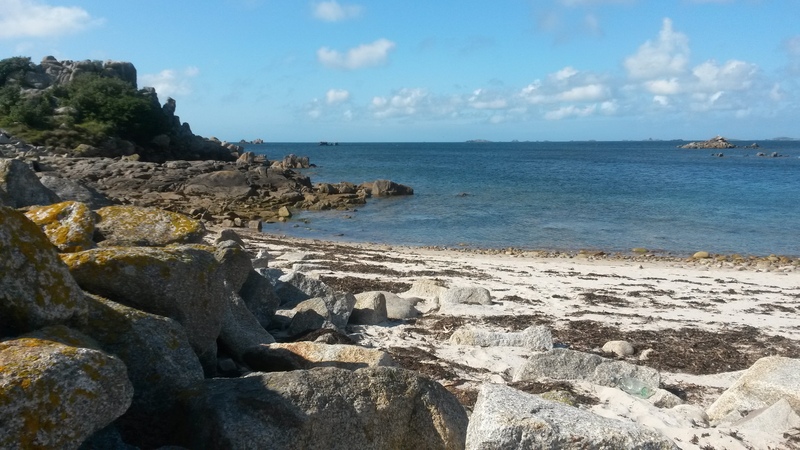 It is found only on the Isles of Scilly (a idyllic group of small islands about 30 miles south west of the tip of Cornwall) and some of the Channel Islands. Hence they are often referred to as Scilly shrews, (although it’s not that unusual in Europe). I’ve had rather mixed success at seeing shrews for my British Animal Challenge. I have seen common and pygmy shrews, but only when they’ve happened to be in dormouse boxes I’ve been checking, not when I’ve specifically been looking for them. Water shrews have proven even harder. After hours, over several days, of standing by a pond where I know they live, I still haven’t seen one (although I think I heard it). So, keen to maximise the of seeing one during my stay on Scilly, I did some research. I emailed the Isles of Scilly Wildlife Trust, to see if they had any advice. They replied, very helpfully. The best island to see them on is St Agnes, as work has been done to eradicate rats on the island, which has helped shrews as well as seabirds. That was encouraging, as I was planning to spend a week camping on St Agnes, not just a day trip. I also asked someone from the RSPB on Tresco, and local Isles of Scilly naturalist, Will Wagstaff for advice on how best to see a Scilly shrew. Once I arrived on St Agnes, I was on full alert for shrews (luckily Scilly is only home to one type of shrew, which simplifies identification). Shrews have fast metabolism, and have to eat frequently, so they are active both day and night. Every stroll was slowed down by my staring at the stone walls that line every road on the island. My ears strained to hear the rustle of foraging, or a high-pitched squeak as two shrews meet. At night I used my powerful headtorch to try to spot light reflecting back from a shrew’s eyes, but all I saw were rabbits and pinpricks of light reflecting in the eyes of spiders and moths. I needed to change my strategy. One of the easiest places to see shrews is on the boulder beaches, near the high-tide line of dried seaweed, where they come to forage. It’s not that they’re more likely to be there than elsewhere on the island (in fact, they seem to prefer being near houses), but you stand more chance of seeing them there as there’s less vegetation to hide them. So, after five days of no luck with seeing shrews, I decided it was time to get serious: I needed to spend some time on a beach. On a sunny afternoon Dr C and I found an empty beach, and settled ourselves down on the large boulders at the edge. Armed with binoculars and camera, I scoured the seaweed line for shrews, while Dr C quietly read his book. 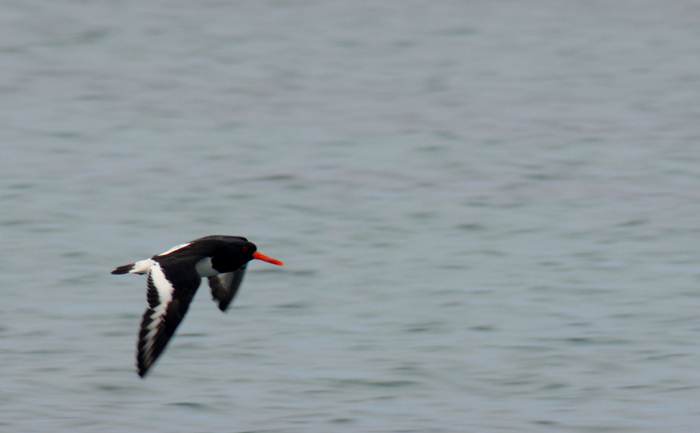 There was plenty of birdlife, including a fleeting glimpse of a kingfisher. After 45 minutes of hard looking through the binoculars, constantly alert, Dr C got my attention. He’d heard a sound, and then saw a shrew’s nose poking out from a gap between two rocks, just a foot away from where his foot was resting. I had missed it. 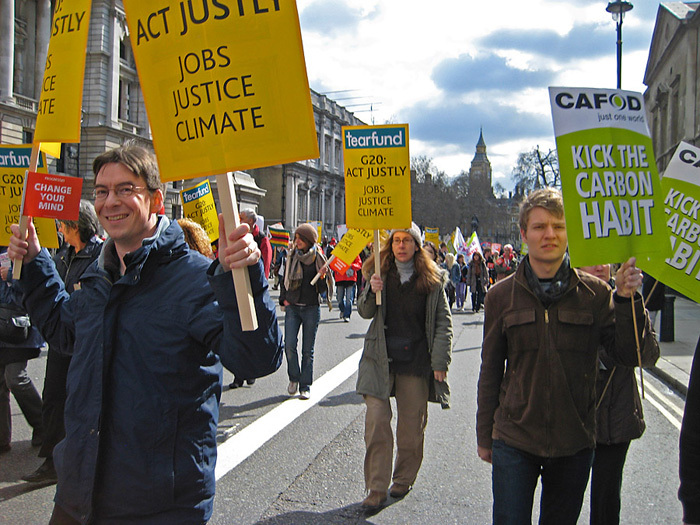 I was partly encouraged – we knew now we were definitely in the right place. And partly frustrated at missing one so near me. Mainly I was amused that while I’d been scouring the distance through binoculars, there was one so close. I think the shrew must have had a sense of humour. Not long after the Dr C’s sighting, I spotted a grey back and tail scuttling between two rocks a couple of metres from me, and heard a squeak and then some twittering. A little later I spotted a womble-y nose poking up by Dr C’s foot again. So, I didn’t quite manage to see the whole of a Scilly shrew in one go, but if you put together the bits I did see at different times you’d be able to get a whole animal. The things that struck me from the sighting we must either have been very good at keeping quiet, or the shrew wasn’t too bothered by our presence. It’s not often a wild mammal will come that close to you (even a house mouse will keep its distance). So, another successful day for the British Animal Challenge. And one of the pleasantest so far – sitting on a beautiful, empty beach on a warm, sunny afternoon, seeing a species for the first time. What more could I want?! Please excuse the excessive exclamation marks in the title of this post. I am just rather excited about the dormouse box check at my site this month. Having only found one dormouse at my site so far this year (and even that was months ago), this month we found a whole family of healthy, lively dormice. I think word must have got round Surrey Dormouse Group that my site isn’t the best bet for seeing dormice, as my only ‘volunteer’ this month was the wonderful Dr C. I think he brings me good luck with dormice, as we found the previous dormouse on a check when he was my only helper. Anyway, hopefully now we’ve got a few more dormice at the site, we’ll have more regular success so volunteers can get some dormouse handling practice. The occupied box had a lactating mother with three lively, eyes open young. It won’t be long before they will be able to leave the nest and live independently (hopefully in some of our nest boxes). Dr C saw the mother’s nose peer out of the nest when he was checking the box. It’s the time of year when dormice are busy having babies, so we knew that there was a real possibility that there may be young in the nest. 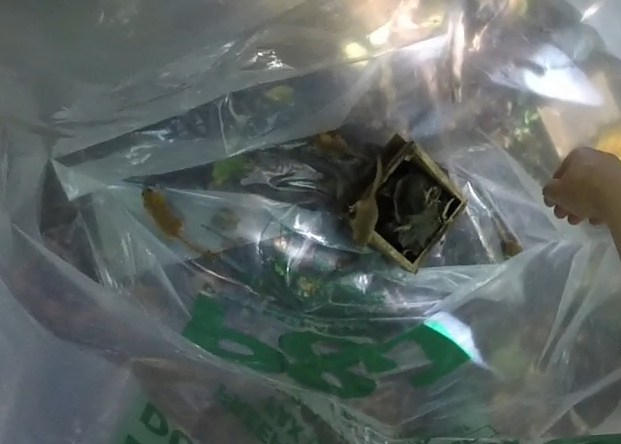 That was quickly confirmed – as soon as we had put the box in the rubble sack and taken off the lid, the bag was full of four dormice dashing round at incredible speed. Having so far only handled one, torpid, dormouse this year, trying to safely catch and bag each of them was an intimidating prospect at first. But, after taking a deep breath and picking a target, I got the first one, and it got easier from there. Young dormice are harder to handle than adults – there’s less to get hold of, and their paws seem stickier, allowing them to climb arms more easily (something you have to keep an eye on when you’re dealing with several at once – you don’t want any escaping up your arm while you try to catch a different one). After catching, weighing and sexing each mouse we put them carefully back into the nest. Not all of them seemed very keen on going back in, but once in they stayed there. 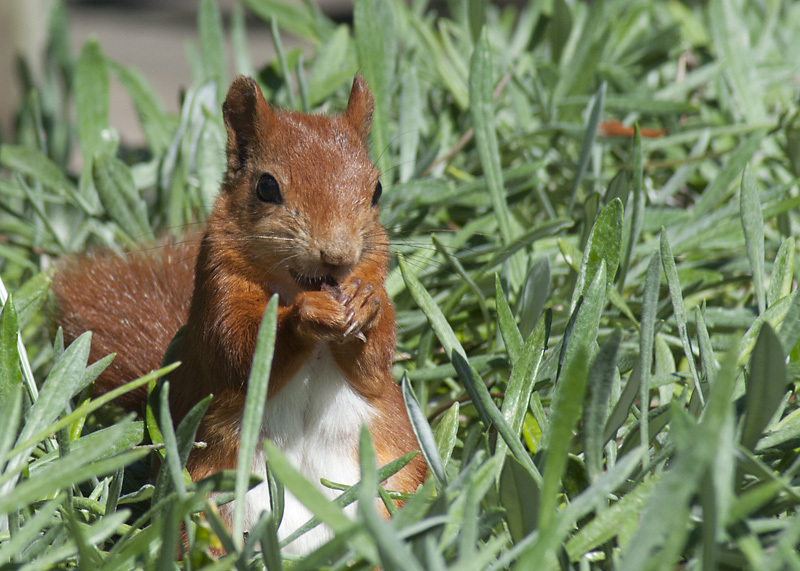 There’s plenty of food around, so they should have time to gain enough weight to hibernate through the winter. And they all looked in good condition. Apart from delight at seeing lovely dormice, this new find is also really encouraging as the nest was in a different part of the wood to where we’ve found the other dormice nests. 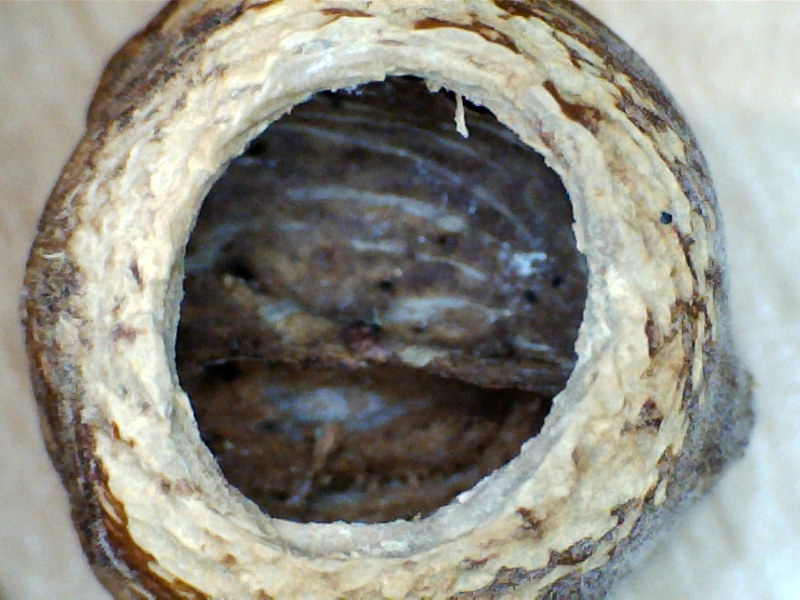 We also found another new (unoccupied) nest in another part of the site. At some sites you find most of the activity in a relatively small area, but, from this first year of monitoring, it looks like they’re present across most of the monitoring site. While four dormice (one family) isn’t a huge number compared to some other sites, it’s the highest we have had so far, and I am encouraged by it. 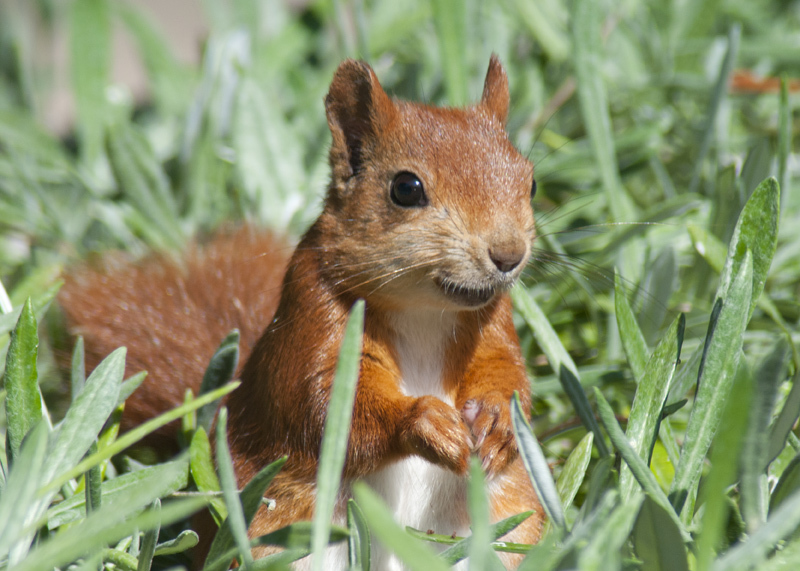 While their American cousins, grey squirrels, are not universally popular in the UK, everyone loves our native red squirrels. Everyone may love them, but many of us have never seen them in the wild. The once widespread animals are now restricted to a few small pockets of England and Wales, with Scotland being their main stronghold in the UK. 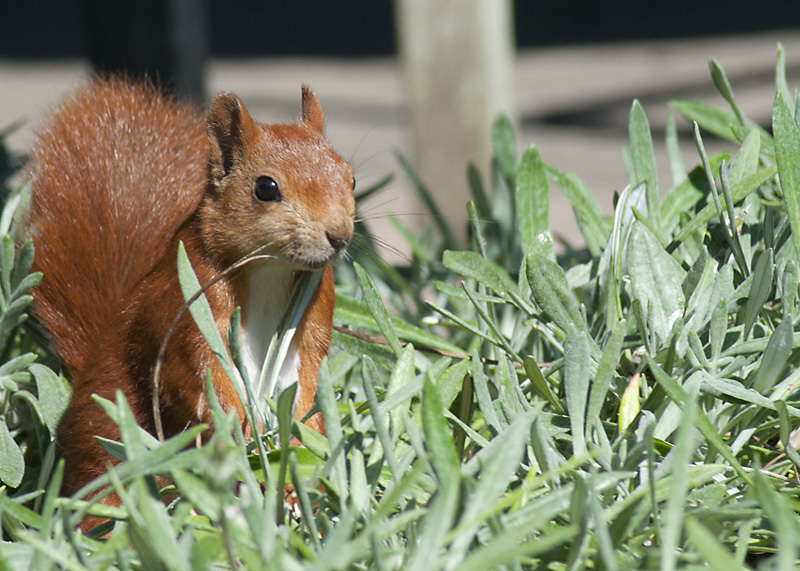 The only red squirrels I had seen were in captivity at the British Wildlife Centre. 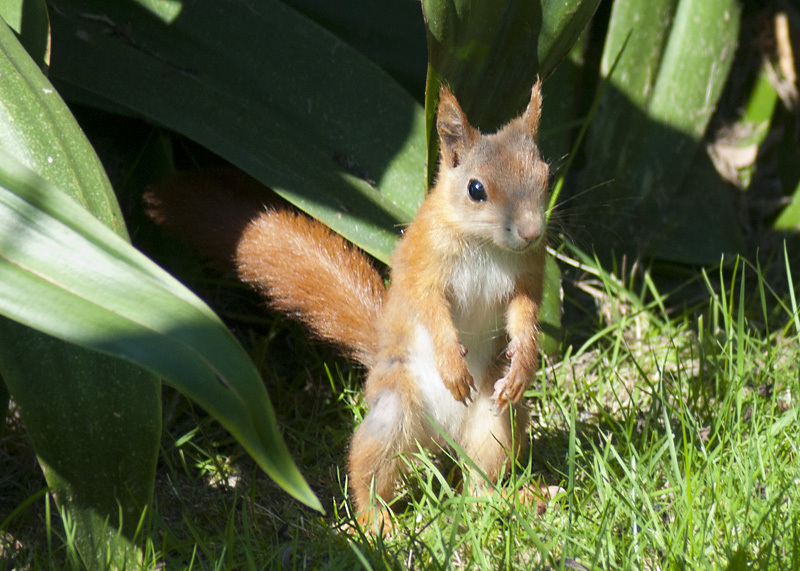 Apart from wanting to see red squirrels because of their unarguable cuteness, I needed to see them in the wild if I am to ever complete my British Animal Challenge. So, on a recent trip to the Isles of Scilly, one of my goals was to see the charismatic creaures. 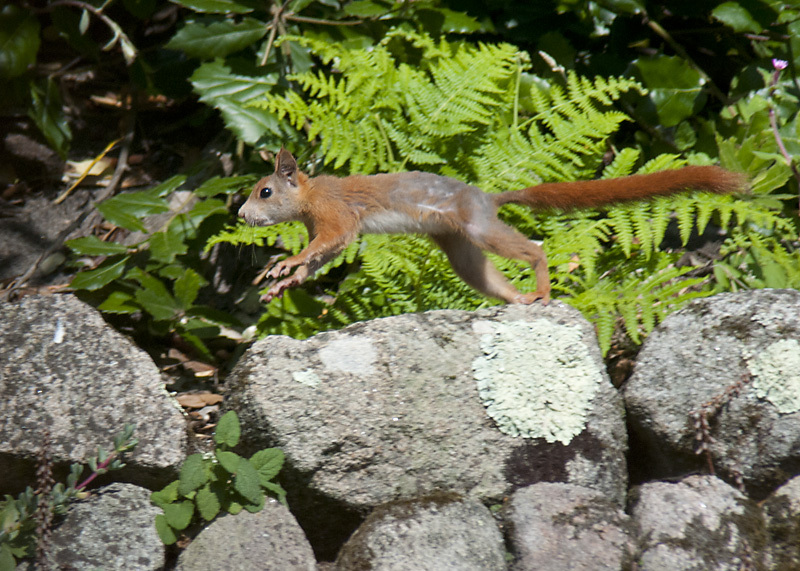 Red squirrels haven’t always lived on the Isles of Scilly. A small population was introduced to Tresco, the most wooded of the archipelago, in 2012. 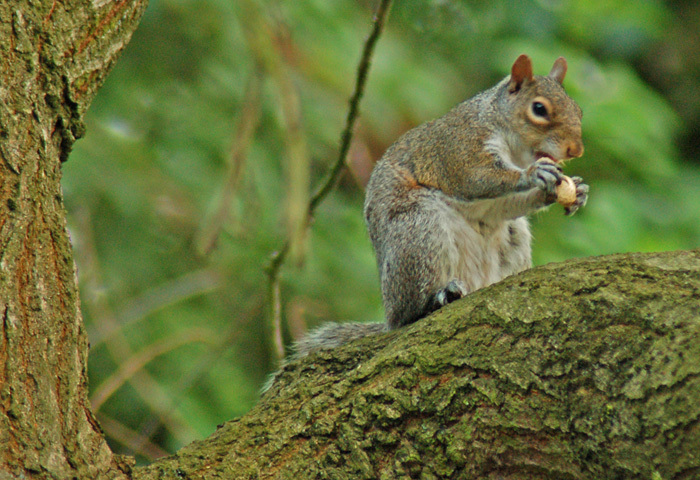 It was thought that the island, which is free from grey squirrels, would be a safe place for a new population, far from squirrel pox and the competition of the bigger grey squirrels. 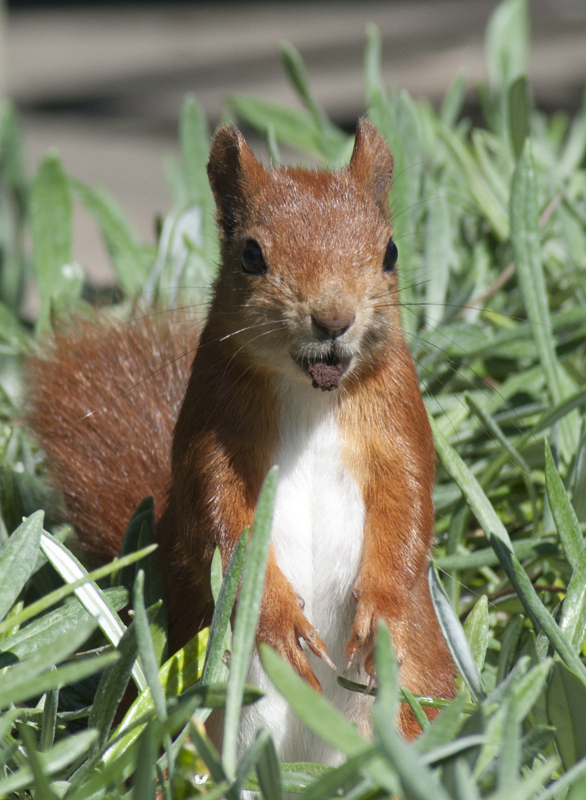 The initial five squirrels, introduced in late 2012, didn’t fare too well, with only two making it through the winter. But in 2013 20 more red squirrels were helicoptered in (having been born in captivity at the British Wildlife Centre), and this batch seem to be thriving. 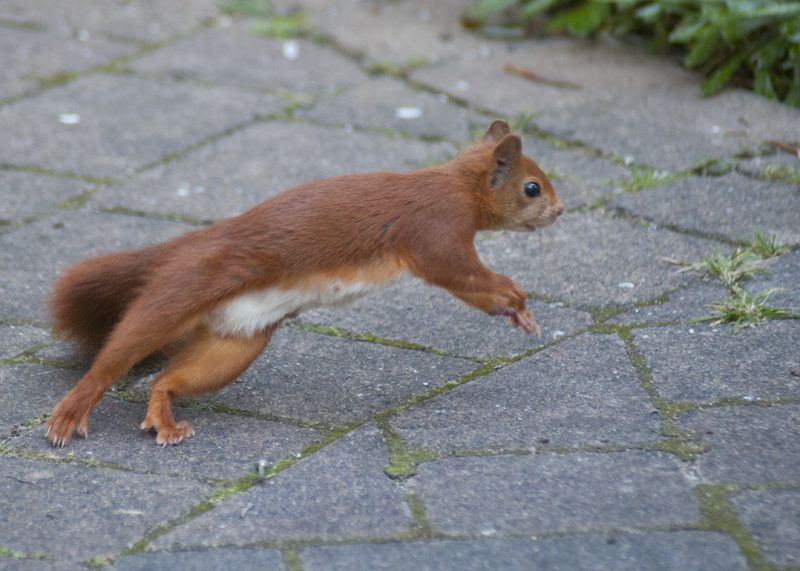 By the end of 2014 there were estimated to be 40-50 red squirrels on the island. 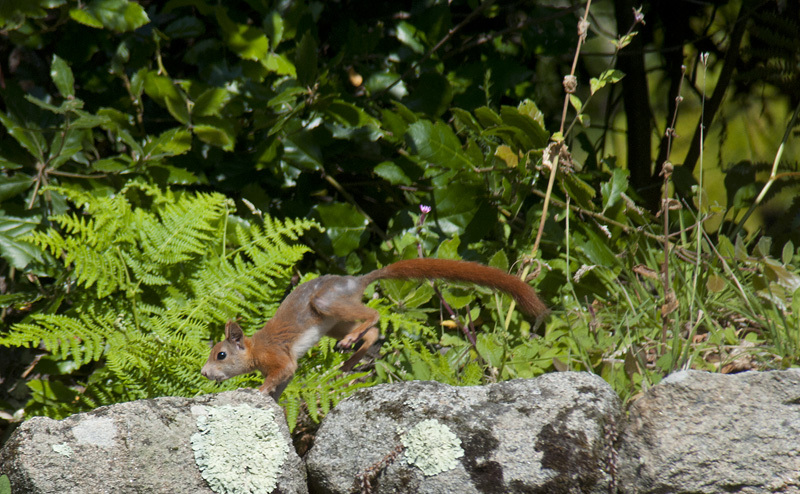 So, a few days into our stay, Dr C and I got the boat to Tresco, and started on a squirrel hunt. A walk down through the woods in the middle of the island provided no sightings, so we decided it was time to ask for some advice. The RSPB had a small team conducting free bird watching walks around the island, so we joined one of these, and asked for hints as to where best to see them. The answer, unsurprisingly, was among the conifers. But there are also feeding stations in the Abbey Gardens, which are a pretty good bet. Just as the walk was finishing by the entrance to the gardens, I spotted a flash of red on the ground, rummaging in the leaf litter then darting off out of sight. 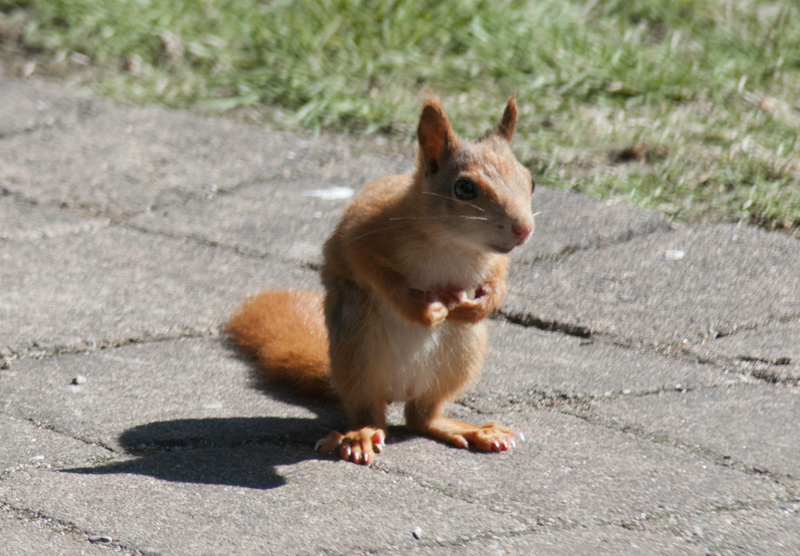 I had seen my first red squirrel! Sadly my photos, taken in the shade of the trees and obscured by foliage, left something to be desired. Still, I had seen one, so Dr C and I decided it was time to celebrate with a spot of late lunch. The Abbey Gardens cafe garden was pretty empty – just us and a couple of other people. 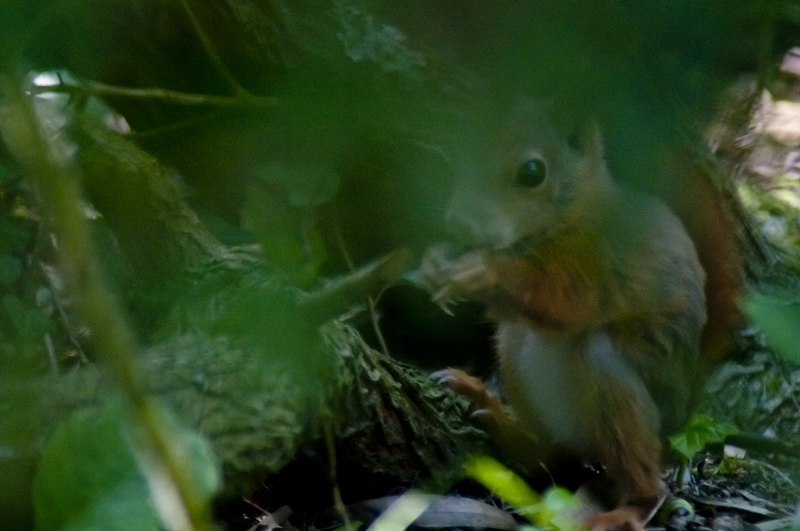 And some red squirrel kittens and an adult. Like their relatives back at the British Wildlife Centre (and the house sparrows on Tresco), these squirrels were pretty bold (and pretty, for that matter). They came right up to our table. After having spent a while searching for them elsewhere on the island, it seemed almost too easy to have them walk right up to us. But neither of us were complaining. Lunch lay forgotten on my plate as I followed them round the picnic tables, trying to get a good shot. They’re speedy little things! Here’s what I managed. 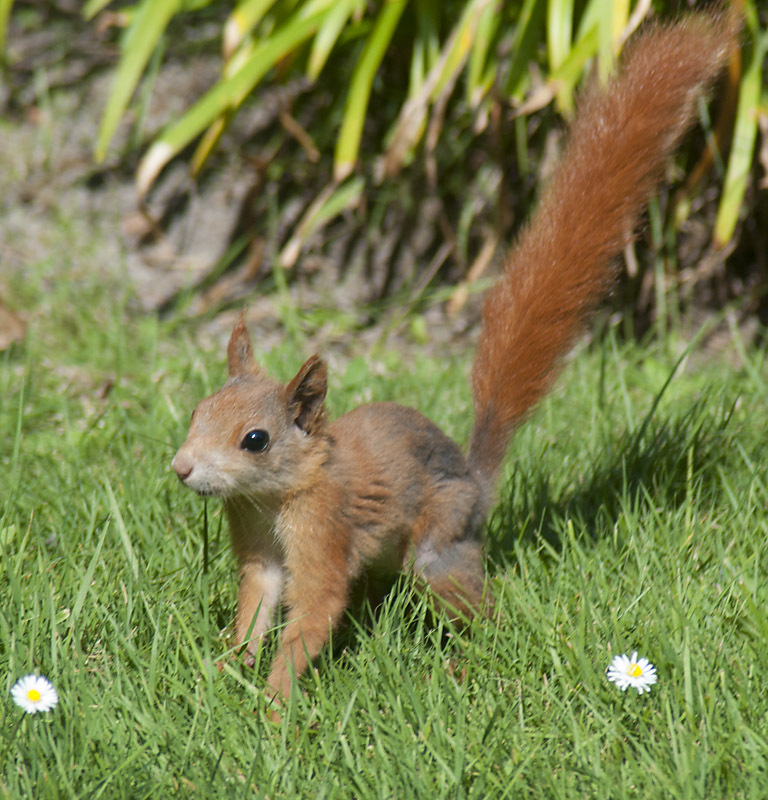 Mum showed up after a little time, her tail much bushier, and her fur a beautiful deep red (the kits were still grey in places, and their tales were not yet the resplendent bottle brushes you expect from a squirrel). She posed for a while in a flower bed before disappearing off, leaving me to finish my lunch. So, another new species seen for the British Animal Challenge. And a very pleasant day out. Ever since I learnt that choughs have returned to Cornwall after decades of absence, I’ve wanted to see some. But a chough spotting expedition down to the Lizard earlier this year was unsuccessful (at least with regards to seeing choughs). A recent visit to my parents gave me another opportunity to spot the emblematic corvids. Having learnt from the previous unsuccessful attempt to see choughs, we decided to get some expert advice. Dr C and I drove to the Lizard, and after a quick pasty, sought the advice of one of the National Trust volunteers who were pointing out wildlife of interest to visitors. It wasn’t what I was hoping to hear. September isn’t an easy time to spot choughs, as the youngsters have fledged and moved away, and the adults, no longer tied to the nest, can move further afield and are harder to predict. Apparently, if we came in April or May we would be virtually guaranteed a sighting, but not at this time of year… Still, they sometimes feed near Kynance Cove, a few miles around the coast, so if we walked in that direction, we might get lucky. So that’s what we did, following the coast path. A kestrel put on a good display for us, repeatedly hovering in mid-air, then plunging to the grass, only to return to the air empty clawed. After perhaps a mile or so a pair of corvids flew past, dark against the blue sky. It was worth checking out, and a look through the binoculars revealed the bright red legs and curved red beaks that make choughs so recognisable among British corvids. After very little walking, watching or waiting we had seen our first choughs! It felt like we hadn’t yet earnt it that day – some wildlife spotting is hard work, but this was easy. We watched the choughs til they glided over the brow of the hill, then continued our stroll since it was a pleasant day. On our stroll back towards the Lizard point, we got an even better view of the choughs – a pair were feeding right on the path maybe 50 metres in front of us. They seemed unperturbed by the walkers approaching from the other direction, and merely moved a few metres off the path when the walkers got right up to them. A perfect photo opportunity, but I had been lazy and not taken my camera on the walk, so I’m afraid I have no pictures of choughs to show you. The best I can manage is this panoramic shot of the coast that I took using my phone. It was wonderful to see such splendid birds at close quarters (I’m a corvid fan anyway, but choughs win the beauty competition among British corvids in my opinion). And it’s particularly exciting to see a conservation good news story in real life, particularly one that is so closely linked to the history and culture of the place where we saw it. It was a successful start to our holiday, and boded well for our other wild adventures. Today is the 2nd birthday of this blog, so to celebrate I’ve been back over my posts from the last year, and picked a couple of my favourites from each month. I quite enjoyed looking back – brought back lots of memories! Photo Special: Isles of Scilly – I had to choose this one, really, as not only do I quite like some of these photos, but, as it happens, I’m actually in the Isles of Scilly at the moment. It’s a beautiful place with excellent wildlife watching opportunities. Hedgehog pawprints – I just love hedgehogs really. Scrumping badgers? – it’s so exciting seeing badgers (even if I didn’t get any photos)! 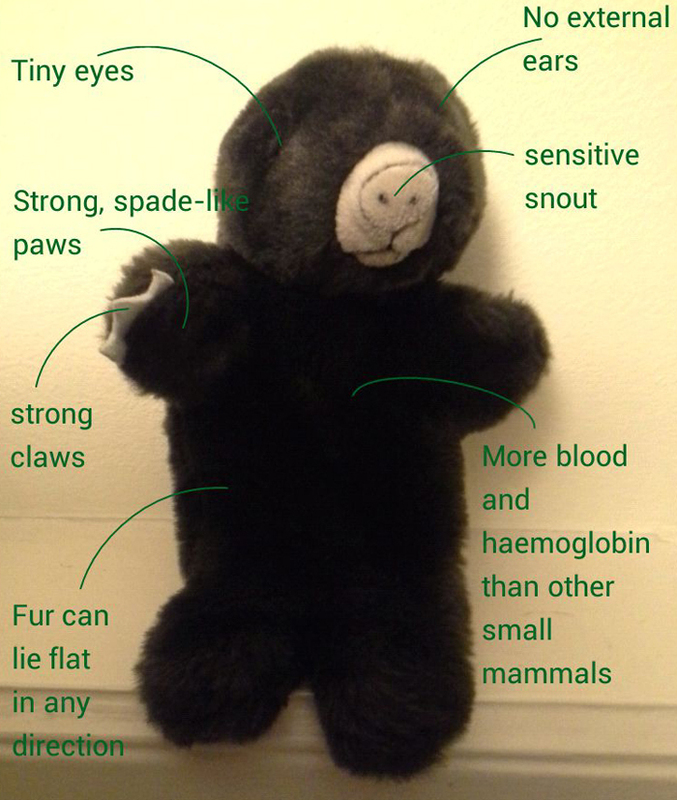 Moles: perfectly adapted – I’ve still never seen a mole in the wild (alive, at least), but you can’t help admire how suited they are to their subterranean lifestyle. Looking for Harvest Mice at an airport – this day of surveying for harvest mice at Gatwick airport was really memorable, even if we didn’t find any in the end. It’s fascinating to see what wildlife can exist even in the most unlikely places. How to tell who’s been nibbling your nuts – some close-up photos of nuts nibbled by dormice and other mice, with guidance on how to distinguish between the two. Dormouse licence! – It took a long time to get enough experience with handling dormice to obtain my licence, so this was quite a significant milestone for me. This year I’ve enjoyed having my own site to survey. 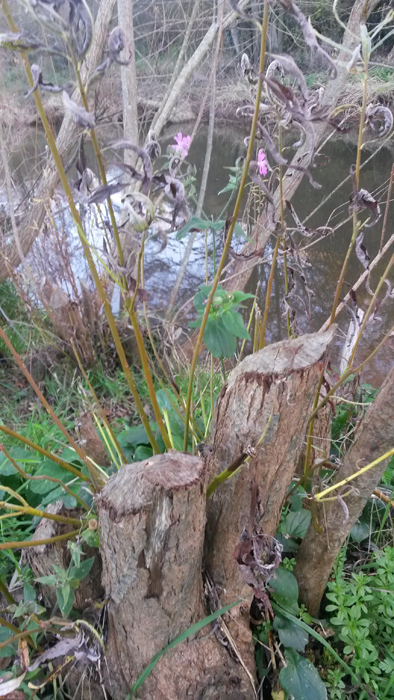 On the trail of wild beavers – I’ve really enjoyed following the story of England’s first beavers in the wild for hundreds of years, and it was amazing to see signs of them when we were visiting the River Otter. 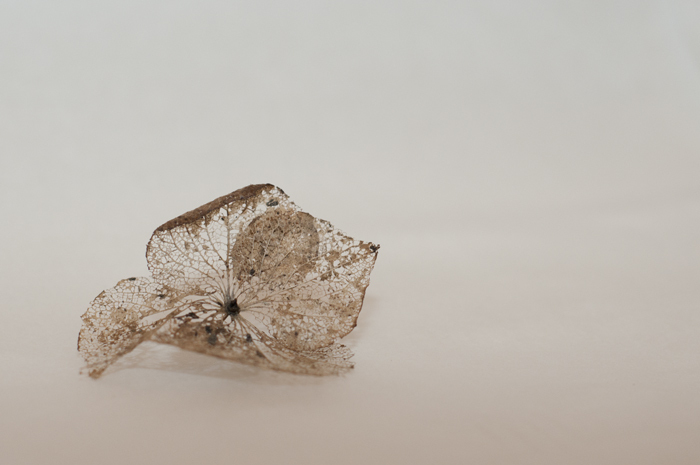 February photography challenge: still life – I was really pleased with some of the still life photos I took in February – it pushed me beyond my usual techniques. Choughed to see porpoises – another wildlife adventure where I see something different from what I was aiming for. Dormouse box cleaning at my new site – getting ready for the dormouse season at my new site! How to use a mammal footprint tunnel – A ‘how to’ guide on using a tool to find out what mammals visit your garden. 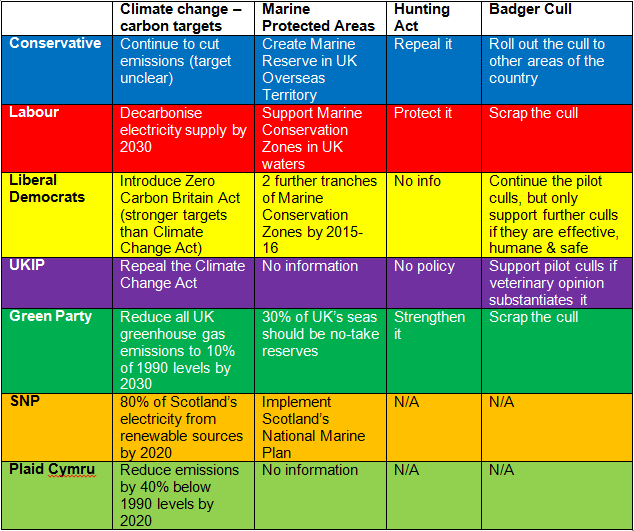 Election summary – I spent a couple of months during the election campaign trying to find out where the main British parties stood on various issues relating to nature, the environment and wildlife. 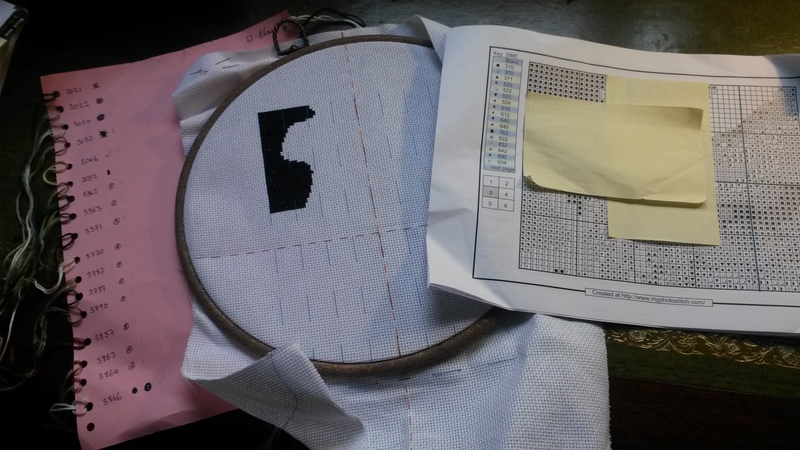 I must say, I didn’t enjoy the process much – it was quite dispiriting. But this post summarised all that work. In which I learn I need a new approach to seeing bats – another batty adventure. 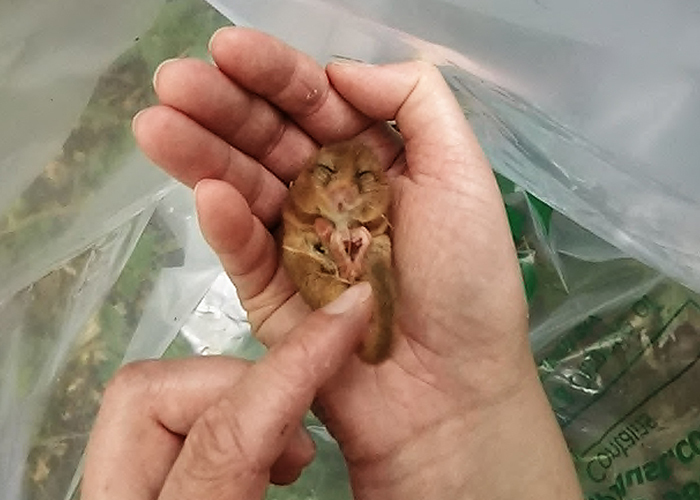 First dormouse at my new site – this was so exciting – the first dormouse I found at my new site. To add to it, I’d taken my GoPro, so was even able to get some footage! How to turn a pallet into a vertical flower planter – this afternoon project has really brightened up a dull bit of my garden, right outside my study. And it was surprisingly easy. Too darn hot (or how to help wildlife during a heatwave) – I think the rather dull summer we’ve had might be my fault – I wrote this post during a hot period, and since then heat has not been a problem. But still, it’s good advice for if we do get another heat wave. 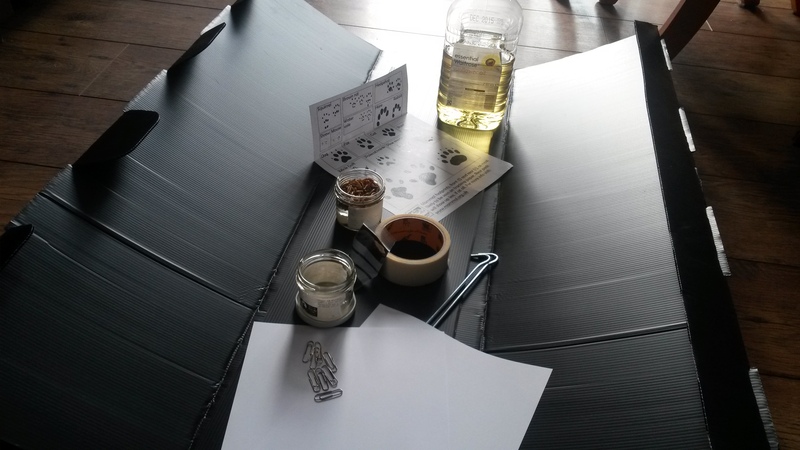 My barn owl project – this is a little different from the projects I usually write about on this blog, but I’m enjoying it, and making good progress. Bird nerd part 12: 2014-15 compared to previous years – I like this post as it presents data from my garden birdwatching in a rather more visual form than usual. I’d like to do some more infographics for this blog. Woodlice breathe through gills, like fish. That’s why they need to hang out in dank places.